"IAOMT and its members have been independently studying the toxicity of fluoride for decades," Matthew Young, DDS, President of the IAOMT, explains. "For dentistry, as an ethical profession, it is imperative to uphold the concepts of 'do no harm.' Fluoride has traditionally been seen as a panacea for dental disease without the knowledge of its inherent harm to the human body. We need to seek less toxic alternatives and work to improve human health with the safest approach." This week, the IAOMT is officially releasing a variety of new fluoride awareness resources available for free on their website. The materials were developed based on the group's new Position Paper against Fluoride Use in Water, Dental Materials, and Other Products. Hundreds of scientific studies and research articles were analyzed to create this detailed document, which includes over 500 citations supporting the potential for fluoride to cause adverse health outcomes. The IAOMT's official position is that given the elevated number of fluoride sources and the increased rates of fluoride intake in the American population, which have risen substantially since water fluoridation began in the 1940's, it has become a necessity to reduce and work toward eliminating avoidable sources of fluoride exposure, including water fluoridation, fluoride-containing dental materials, and other fluoridated products. "Ingesting synthetic fluoride, such as that added to community water, is not only ineffective at reducing tooth decay, but it also exposes our population to a number of toxins," David Kennedy, DDS, lead author of the IAOMT Fluoride Position Paper, cautions. 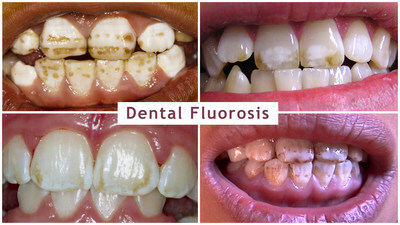 "American children are already being overdosed with fluoride, as is evidenced by the increase in tooth mottling (fluorosis), which now occurs to some degree in a majority of our youth. The National Research Council determined that many individuals are exceptionally vulnerable to the toxic effects of fluoride. When will people realize that scientific research offers grave warnings about fluoride? Don't we all deserve safe water?"